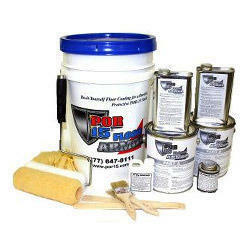 While using Floor Armor Basic Kit no need of acids, no need to flood your floor with water just use our easy degreaser on any heavy oil or grease stains, vacuum away any dust or dirt, and paint right over everything with Floor Armor. Get the same fantastic results you have come to expect from world-famous POR-15 Rust Preventive Paint, with this terrific new product. It is the result of several years of development by our own chemists and product specialists. Use Floor Armor in heavy traffic areas. It can take the abuse from forklifts, floor jacks, and constant traffic. Once your floor is covered with Floor Armor, you'll wipe up oil and grease stains with a rag, and keep dust down too.